← what does wisdom look like? As the tenth grade students are finishing MACBETH, this reminder appeared on the radio today. I have attached a question for them, to suggest the value of an artist’s view. If it (the murderous act–large or small) were done, then ’twere well it were done quickly; otherwise, our conscience would force us to consider the human consequences. Pay no attention to that man behind the curtain, says the wizard of OZ. Hamlet instructs the players that drama holds, as ’twere, a mirror up to nature, so that we have a better chance of seeing what we are actually doing to ourselves and others. Indeed, the plays of Shakespeare and other artists, help us, make us pay attention. 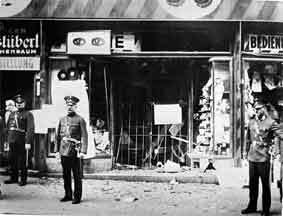 “Today is the anniversary of Kristallnacht, the night in 1938 when German Nazis coordinated a nationwide attack on Jewish homes, businesses, and synagogues. The attack was inspired by the murder of a German diplomat by a Jew in Paris. When Hitler heard the news, he got the idea to stage a mass uprising in response. He and Joseph Goebbels contacted storm troopers around the country and told them to attack Jewish buildings, but to make the attacks look like spontaneous demonstrations. The police were told not to interfere with the demonstrators, but instead to arrest the Jewish victims. Firefighters were told only to put out fires in any adjacent Aryan properties. Everyone cooperated. I just read in the NYTimes yesterday about a U.S. town where the high school students are taunting, hazing, and harassing Jewish students – and where the principal himself is Jewish. He claims there is little he can do to change the long-standing anti-Semitic behavior of the families and their children who engage in the acts. The Jewish families have sued – the school has disciplined the offending students – and swastikas and more remain on the school bathroom walls and the Jewish students are still harassed. The mirror we hold to nature, to ourselves, is dark, is it not? Indeed. I emailed that article to myself at school, to consider using it with the tenth grade students. As I think further, though, the seniors just wrote essays about BEOWULF, in which they responded to Seamus Heaney’s claim in a PBS interview that [worthy] poetry has no tense because it shows us what kind of creatures we are. These seniors explained how the Anglo-Saxon poet’s work answers the question, “What kind of creatures are we?” Suggestions about which group would make the most thoughtful use of this NYTimes article? It might be that the English Dept members themselves would be a first audience for dialogue…. Indeed again. I will ask them, too.